What is wrong with this phrase: “A large amount of persons”? It should pop right out at you — “persons” do not come in amounts or quantities; they come as individuals. They are countable. Aggregated, they become “many,” not “much.” Reduced in number, they are “few,” not “a little.” You can refer to them as “each one” or “every one,” and the “one” should remind you that you are in a category that is countable. Add to “some,” and you may find you have “many” (number) or “much” (amount). Take away part of it, and you have “few” (number) and “a little” (amount). The comparative “more” is used to express an increase in both number and amount. In the superlative, “most” is used in both contexts as well. 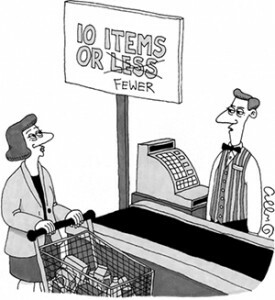 On the side of diminution, however, the picture changes: The comparative “less” is reserved for uncountable nouns (amount) and “fewer” is used for number. In the superlative, “least” is reserved for amount and “fewest” for number. abundant, adequate, ample, complete, considerable, copious, countless, endless, galore, generous, heaps, immeasurable, lavish, loads, plenteous, plentiful, prodigious, profuse, sizable, substantial, sufficient, voluminous. Put “a lot of” in the same category as “kind of”: fallback phrases used by habit, to avoid going to the trouble of figuring out what you really think and then expressing it. Previous Previous post: Infinitives: To Split or To Not Split?